Run Forrest ! Run !! If you are a big fan of a movie, "Forrest Gump", you definitely had to come to this restaurant! Located not so far with Discovery Mall - Bali, this restaurant really a total "Forrest Gump" geek ! This restaurant filled with manyyyyyy Forest Gump memorabilia. It's everywhere! on the wall, on your table, etc. They're also provide a souvenir shop inside the restaurant ! It is said that this restaurant comes from California ( and many US cities ), it is their first chain on Indonesia which is in Bali. The atmosphere was so friendly and homey. The waiter are so friendly. And you know what, at the time I'm going there, there's a quiz going on. So the waiter asking a few questions about Forrest Gump Movie, then if you can answer you can get some souvenir :p Another interesting thing is, if you want to order, you must flip the sign on your table from "Run Forrest Run" to " Stop Forrest Stop!" 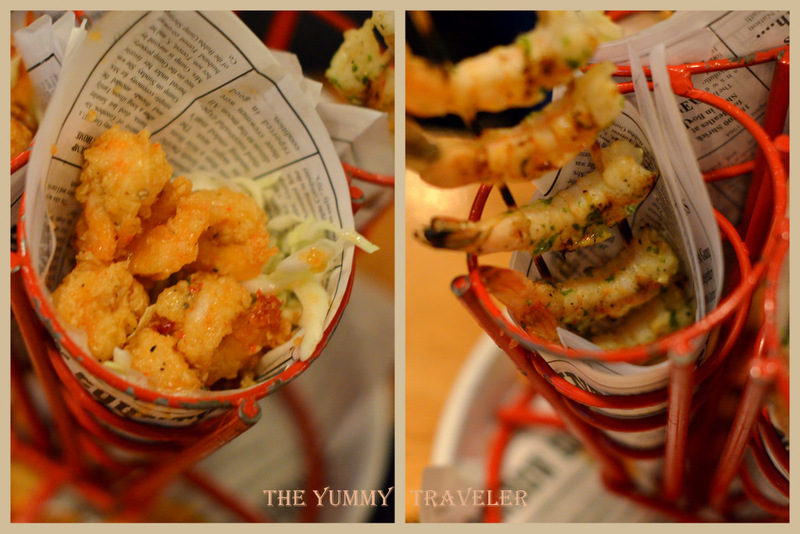 Of course because of their name is "Bubba Gump Shrimp Co. " they're offer many kind of food with shrimp in it ! Before we eat, we're given some Shrimp Crackers snack. First, we order Shrimper's Heaven - IDR 227.273. At first we see it, we was quite amazed of the portions because they put all the food in some ( I could say ) small basket. But after we eat, below the shrimp was actually a shredded cabbage ( oh well ). There's a 4 types of food that made with shrimp which is, fried shrimp ( like tempura ? ;p ), popcorn shrimp, shrimp in skewers, and shrimp ball. This dish served with french fries, coleslaw, and 3 types of sauce which is tartar sauce, mayonnaise and the sour sweet sauce ( I'm not sure what sauce is that ;p ). The four of it was taste nice and fresh. But what i like the most is the shrimp ball. Crispy outside, but moist and savory inside. Yum! Enough of shrimp, we order House Special Calamari - IDR 63.636. The Calamari, fried perfectly and also there's a fried paprika in it. Well for me, this dish quite so -so. Forrest Gump: "Momma always said life was like a box of chocolates. You never know what you're gonna get"
Found your blog when I tried to search this restaurant! I went there for the second time last June and decided to put in my blog as well. How about staying in a Serviced Apartment? Ready for new dishes at C's ? Are you ready for cheese tart-craze ?? Breakfasting ideas for you to try in this Ramadan month? Another use of Kecombrang? Make a fragrant fried rice ! and your brand will be viewed by 20.000/month! Follow Me by Email !